RosieSandz: My Life Lessons...: Is Your Closet Full of skeletons Too? 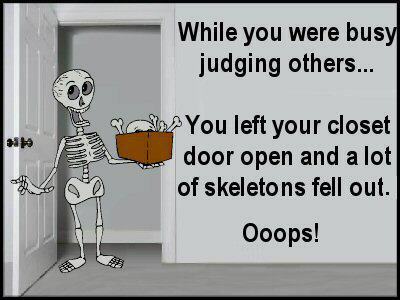 The facet of the matter is; we all have skeletons in our closet. Yes, each and every last one of us does. Everyone has something to hide, and if someone claims that their life is an open book, I’ll bet that there are at least a couple chapters you’ll never get to read as they have been conveniently omitted. Everybody has “those things” that they would rather keep to themselves; we all have things, events, and stories that belong to us and probably need to remain just that … ours! Secrets-Skeletons/Skeletons-Secrets I believe are a reality in everyone’s life. It can be the smallest, pettiest, most insignificant thing, all the way over to the vilest, most contemptible, and life altering acts, depending on how - who has done the action - perceives it. There are certain things that even those who we are close to, do not know about us (scary thought huh?). We have all done something in our lives that we are not proud of and, given a second chance, would never repeat it. Let’s put some emphasis on never. Or, some of us have done things that we deem acceptable but know that someone else would see it as wrong, and therefore judge accordingly…So to makes ourselves feel better, we keep “it” buried in our closets. BUT yet still we like to critique others’ lives. Here comes the purpose of this post J… this is why we all are getting thrown under the bus! We like to judge, critique, give advice and perform the “holier than thou” act, without acknowledging how tainted we are ourselves. I mean, how many people do you know, that you laugh (hard) on the inside every time they try to give you “advice” on something you should do with your life; knowing all along that their life is a hot mess, and they should probably talk with their mouth closed? The point is that we like to put ourselves as coming from a place of perfection, while truly nothing can be more interesting (and disturbing) than our own backyard. My rationale is not that for one to be able to give advice, mentorship or guidance to someone, you have to share all your secrets and release all of your skeletons, so you can be deemed credible (shoot, I have mine and let me tell you, they are staying 10, maybe 15 feet under!!!). My point is that we have to be able to recognize that we have flaws like everybody else and our assessments/judgments have to come from a place of knowledge and love, and (again), not from a “Holier than Thou” attitude. The skeletons in our closet have shaped us to be what we are today, and most importantly, where we are in life today. I speak for most of us (if not all of us) in safely assuming that the skeletons in our closet have made us better human beings. For my part, my skeletons have made me a positive, open-minded person that knows that everything is possible. Looking at times, and thinking about what’s behind that closet door is the proof that we are able to overcome everything. If we could only move past what we’ve done, we could move on to what we want to become. If you have to adopt one motto in your life, let it be, “Whatever happened, happened for the best, and after some time, you will notice that the skeletons in your closet will start to appear as a positive, driving force in your life (versus negative).” Ultimately, it’s up to you to view the glass as half empty or half full, and up to you to translate it within your life. You can choose to be positive or negative, however; you can’t ignore the reasons for your choices, and you can’t ignore your skeletons. Each life is a story worth telling. We have all - in one way or the other - faced and overcome obstacles in our life. We have all asked the question, at least once in our lives, “Why me?” Stop casting stones at those who wear their “sins,” at those who make open mistakes, and at those who trust you/us enough to share their secrets. Judging unfairly and from a place of resentment, while your own backyard is crowded with limbs, is the absolute worst thing to do. The skeletons are there, brothers and sisters, in all of our lives.... sometimes they teach us, sometimes they haunt us, and sometimes they plague us. Let’s not give into them by letting them ruin us. They happened and are there because they shaped and helped mold our lives today. We all have something to hide at some place in our lives. It is how you feel about revealing it, that matters... and that is if you want to reveal it at all. Be confident in yourself and be able to own up to the responsibility and consequences of your past actions. And while you might chose to conveniently forget your past actions, remember when you judge and give advice to others that anything done in the dark eventually comes to light and you don’t want to be exposed as a hypocrite. Let’s try to be human and not like the skeletons in our closet. Life is all about embracing the good, the bad, the ugly, and the skeletons in our closet and making the best of it.